This article in the Paintball Fitness series will focus on how to improve your muscle and joint flexibility. Let's take a look at some common stretching techniques, the pros and cons of stretching, some myths and little-known facts, and how stretching can impact your ability to play Paintball. Biologically, the purpose of stretching is to restore your range of motion after your movement's been restricted for a given period of time. This is why we tend to stretch after getting out of bed or out of a seat in a movie theater. 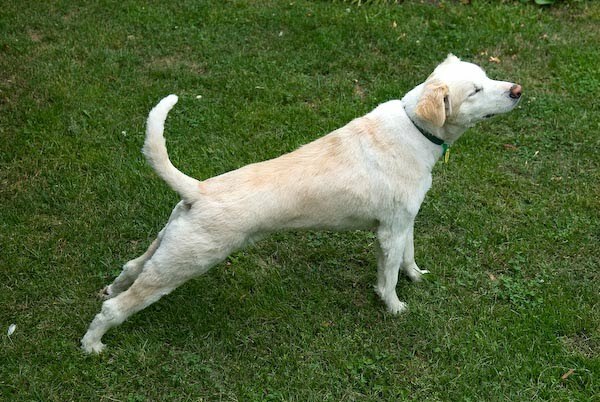 Animals also stretch instinctively - you've probably noticed your pet stretching when getting up from a spot it's been at for a while. Besides this basic, natural stretching, stretching even further (to the outer limits of your range of motion) helps to increase blood flow to your muscles, lubricates them, and readies them for vigorous physical activity. However, whether this actually helps or hurts athletic performance is up in the air at the moment. Although a good session of stretching before a game might make you subjectively feel more "limbered up" and ready to go, some studies have actually shown a decrease in performance when participants stretched before an activity. Why (or if) this happens is still not conclusive, but it may have to do with stretching reducing the normal tension/tonus stored in a muscle and weakening it, and/or reducing the ability of muscle cells to clear out metabolic wastes during intense physical activity. But what about stretching preventing injury? The idea that stretching your muscles before playing sports prevents muscle injuries has been around for a long time, but it too has now been called into question by recent research. Although subjectively you'd think that being "limbered up" and loose makes a muscle pull less likely, some studies have found that stretching has absolutely no effect on reducing sports-related injuries. I would suspect this to be true, as muscle pulls/injuries result when sudden overwhelming forces are applied to a muscle - and usually the flexibility of a muscle has no bearing on this. Is there any good news here? Am I going to tell you next that stretching helps reduce the Delayed-Onset Muscle Soreness (DOMS) that plagues you a day or two after an intense game? Nope. In fact, although stretching after DOMS has manifested itself can relieve the subjective feeling of tightness and soreness you may start to feel 24 to 48 hours after the activity, a lot of research is showing that stretching just before or just after a session of intense physical activity has no effect on reducing or preventing DOMS from manifesting a day or two after the activity. Despite the fact that stretching MAY decrease performance, MAY not reduce your chance of muscular injury, and apparently DOESN'T prevent DOMS, whether you want to perform a few stretches before or after a day of Paintball is up to you. There certainly may be an advantage to subjectively feeling "loosened up", and stretching before and after a day of play would definitely help if you're prone to muscle cramping. If you are going to stretch, then there are a couple things to keep in mind in order to do it properly. Static stretching is a safe and effective way to improve the flexibility of a muscle group. Static stretching involves holding a stretch at the outer limit of your range of motion for 10-30 seconds. The stretch should not be painful, but forceful enough that you definitely feel the stretch. Ballistic stretching is a technique where people "bounce" repeatedly into the outer limit of the range of motion. This technique has fallen out of favour, as it can lead to injury by placing high forces against tendons and ligaments, and because the bouncing against the tight muscle actually causes it to resist the stretch. Be careful not to overdo it when stretching. What I mean by this is that stretching not only extends the range of motion of your muscles, but it also has the potential to stretch out/lengthen your ligaments. Stretching too much and becoming TOO flexible could leave you prone to joint dislocations and ligament tears/ruptures. To illustrate, females, who naturally tend to have more flexibility and joint laxity than males, tend to suffer more ACL injuries (the ACL is an important ligament in the knee that restricts side-to-side movement of the joint). You can counter the laxity effect that a stretching program has on your ligaments by also practicing a strength-training program. One effect of building stronger muscles is that it strengthens and tightens up ligaments as well. There are several resources demonstrating proper stretching techniques on the Internet. Rather than reinventing the wheel and describing exercises here, I'll be directing you to the fine work of others here. In our next installment of the Paintball Fitness series, we'll be looking at the elusive quality known as general agility, and how to improve it.